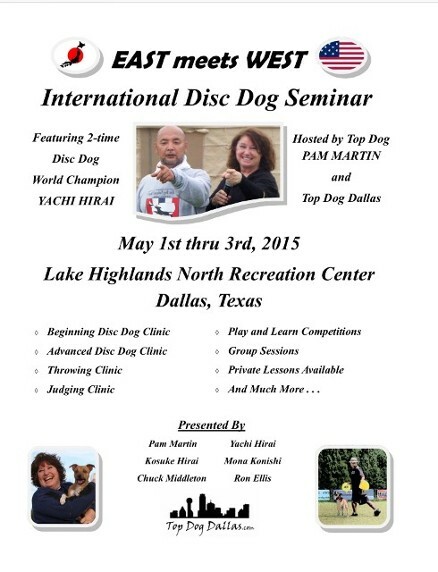 East Meets West Int'l Disc Dog Seminar May 1, 2 & 3 2015 Dallas Texas. Lake Highlands North Recreation Center, 9940 White Rock Trail, Dallas Tx. "So Get your tail to Texas"
This event is outdoors in a park, large field. Indoors restrooms and meeting room. Bring your pop up tents (stakes have not been approved yet so please have other options for securing your tent. 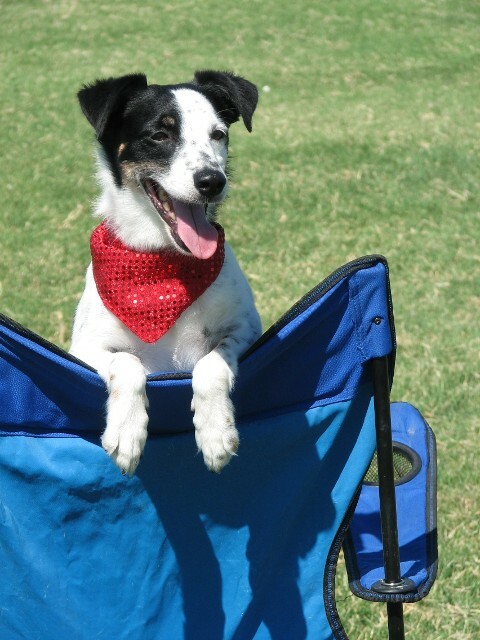 Bring your own comfy crates and lawn chairs much like any other disc dog event. You will need to have a copy of your Rabies Cert as it's the law here to have your rabies vacc. We have a three year vacc in Texas. Kennel cough is highly recommended anytime you are going to be in dog clusters. We have plenty of Instructors on hand so we do not have a working spot limit. Unlimited audit spots. Multi dog discount same handler/2nd dog is available at $5.00 off per day. Yes, fill out the form on the website www.topdogdallas.com East meets West page under Events. Temps average high is 79 degrees and low of 61 degrees. Always a chance of rain in the spring. I am currently checking out pet friendly hotels and will have a list soon. It is with great pleasure for me to introduce the current USDDN World Champion 2014 Yachi Hirai. This is Yachi's first seminar here in the US. Yachi has his own unique style which is highly seeked after in Japan and abroad. This is an educational seminar and we hope that you learn lots of new techniques and gain a better understanding of your dogs needs in order to go to the next level UP. Friday's seminar is indoors, parking in Recreaction parking lot at 9940 White Rock Trail. Sat and Sunday's events are outdoors in a park, large field with curbside parking on Church Rd. across from high school. Meet and Greet and the USDDN Judging Seminar, mostly indoors in meeting room. Apprentice judging opportunity: learn what the judges are looking for. Here's your chance to sit in the hot seat as a judge. Tables and chairs provided plus printed materials. Bring your pop-up tent(s) as we have pleanty of room. 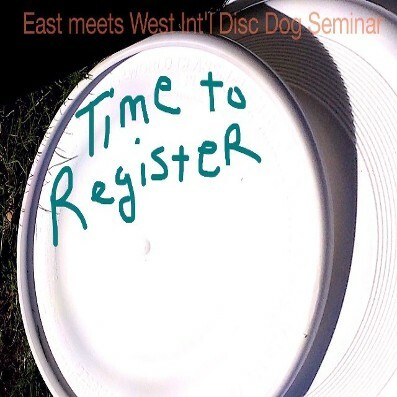 Bring your own comfy crates and lawn chairs, much like any other disc dog event. Bring water. Note that there is no electricity on the field, so feel free to bring a generator. We will need to set up and tear down field for Sat and Sun seminars as there is no security on guard through the night. A list of resturants nearby will be provided soon. Feel free to bring a lunch or snacks for yourself. We will have a small selection of snacks and drinks on hand. It is recommended that you bring a copy of your Rabies Cert as it is mandated by law in Texas to have your rabies vacc. We have a three year vacc in Texas. Kennel cough is highly recommended anytime you are going to be around large groups of dogs. We have plenty of Instructors on hand so we do not have a working spot limit. 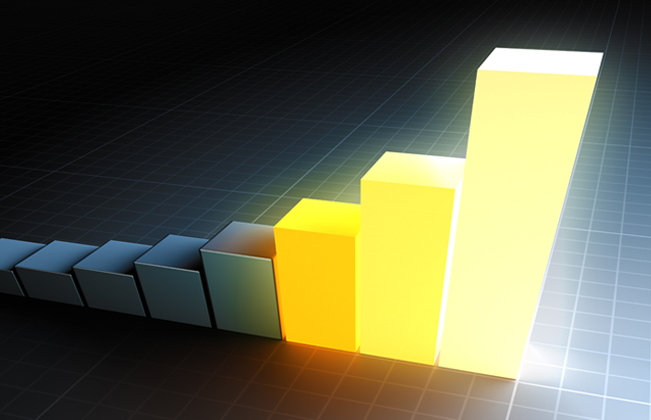 Unlimited audit spots. Multi dog discount, same handler/2nd dog is available at $5.00 off per day. Fill out the form on the website www.topdogdallas.com- East meets West page under Events. Temps average high is 79 degrees and low of 61 degrees. Always a chance of rain in the spring so please plan ahead. If we receive extreme weather we can move seminar indoors. Privates with Yachi upon request also available on Monday. Please plan on staying for a pizza party shortly after the seminar ends Saturday evening.